Donna's Daughter Jenna - Best Slicer Around! Are you fed up of mass-market pet jerky and treats that contain stuff you can't even pronounce? Donna, and her daughter Jenna, came to our rescue with these easy-to-make treats made from real liver and chicken. The best thing about this treat is that it's not imported, it's not full of God-knows-what, it's got no preservatives, no added color, or fillers. It has ONE (as in '1') ingredient. -- You gotta love '1'. 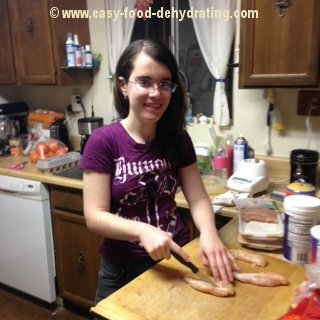 First and foremost: use a sharp knife for the slicing of the meats. A really sharp knife! "My daughter Jenna does this for me because I have a reputation of being dangerous around myself with sharp objects!" Donna joked. I use boneless, skinless chicken breast. Trim off any excess fat. "Fat leaves grease stains on your carpet," says Donna. "Once you have the fat trimmed off, you can give them jerky on the couch if you want," she added with a smile. Remember to slice it as thin as possible. Try to get your chicken about 1/4" thick — but no worries if it ends up a bit thicker than that — it will still dry well. "I've got lazy and bought chicken tenders and simply flopped 'em on the trays. They just take a little longer to dry," Donna said. Spray the trays with non-stick cooking spray, then lay the slices of chicken on them about half an inch to an inch apart. 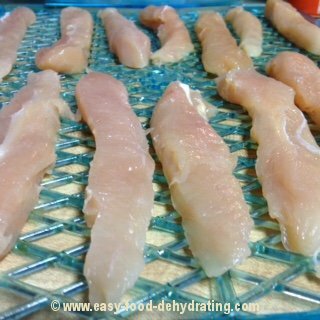 There is NO set time as far as drying because it depends on your brand of dehydrator, the thickness of your chicken slices, the ambient air temperature ... but figure on at least 48 hours. Waiting for their Dog Treats by Donna! Molley and Kylee ask "Is it done yet?" 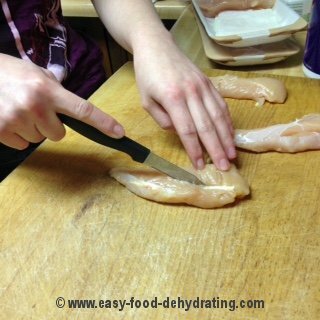 This is how you can tell if the chicken is done: remove a piece from the tray and bend it quickly. If it snaps in half — it's done. If it bends all the way without breaking it's not ready so put it back on the dehydrator and check again — every 12 to 18 hours. 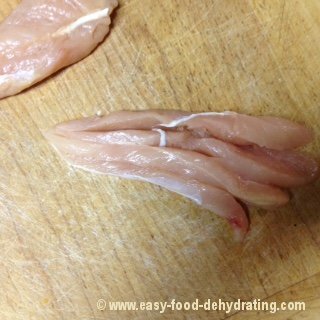 Moisture is what causes the chicken to bend instead of breaking — this happens with any jerky making. 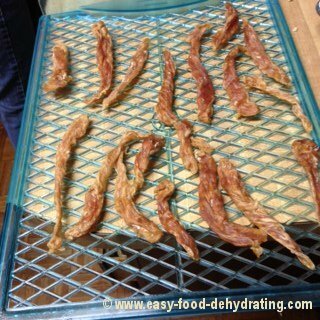 Excess moisture is also what causes jerky to go bad — so a good rule of thumb is: "If in doubt — put it back on the dehydrator." When the chicken pieces break apart, it's done! It also should have a nice roasted chicken aroma. "In rare (very rare) cases it CAN GO BAD. Example: There were a couple of times then I forgot to turn the machine on right away — and once when I made the jerky out in my shed in the winter and it just didn't cook fast enough. You'll know right away if it's not good," she said. Donna added: "If you're at all like me, you check your chicken when you open it (by giving it a sniff!) and you can tell instantly if the chicken is bad. 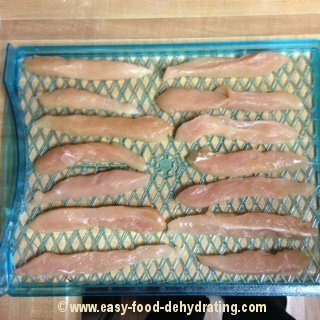 So, if you pull out your tray(s) of dehydrated chicken and it stinks — toss it out. Again, this is a rare occurrence and in my case it was always my fault. Since our pets are family, we don't want to take any chances. If in doubt, throw it out." Last, but not least, there are options if you choose. Sometimes I use beef liver. The great thing about beef liver is that you don't have to slice it! And for Donna, that's a good (safe) thing! 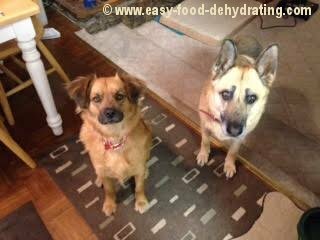 Read all about Donna's Liver Jerky Dog Treats here. If you don't have time to make your own treats, take a look at Dog Treats by Donna on her Etsy store and buy 'em ready made right here!